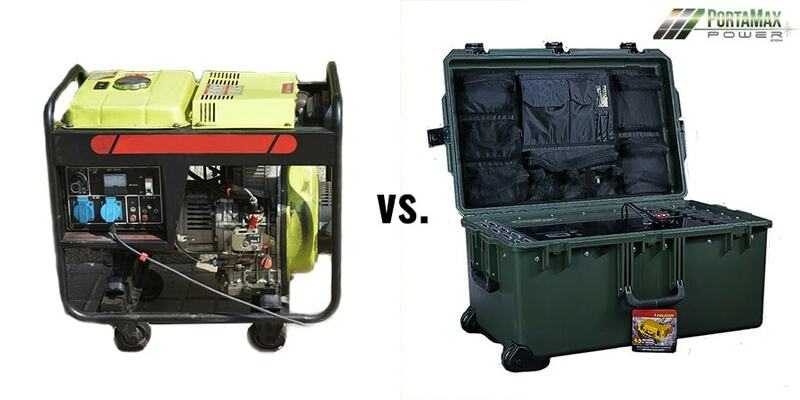 There are a lot of portable generators for sale on the market today for those looking for reliable off-the-grid power. Gas generators have been the traditional choice, because of their ability to provide far more voltage than battery-powered generators. Today, there are also natural gas generators, diesel generators, propane generators, and other types of generators that are powered by fossil fuels. Gas generators may be fairly reliable, but they are not without their drawbacks. Most are extremely noisy, and they force users to breathe in dangerous fumes. Another problem is maintenance. After you buy the unit, plan on keeping it filled with gasoline, changing the oil, changing the spark plugs, and if you want your engine to burn cleaner, putting in fuel treatment so the old gas in the unit sitting between use, does not go bad so quickly (making it difficult or impossible to start the unit and requiring expensive repair costs). Honda has some advanced gas generators that have addressed some of these issues. Some Honda generators are super quiet with electrical components that make them burn cleaner than your average generic generators. Yamaha generators have also come a long way in solving many of these issues. If you are willing to spend a few thousand dollars on the high end, these might be viable options. However, no matter how quiet portable gas generators are or how clean they burn, there is one major drawback that Honda, Yamaha, Champion and the rest of the gas-powered generator manufacturers cannot solve: UN-sustainability. You can make these generators run more efficiently, but at the end of the day, they require you to continually add fuel to keep them going. 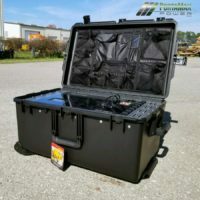 Solar generators have been around now for several years, and manufacturers of portable solar generators often promise users that they can tap into an endless source of free energy supplied by the sun. But is that really true? In most cases…no. The idea of portable solar energy that you can use anywhere is like a dream come true for tailgaters, adventurists, and those preparing for an emergency. However, most solar generators do not live up to that promise. Sure, they give you a battery, and if you’re lucky, they might provide an inverter with the wattage capability to plug in most of your electronics. What they don’t tell you is their battery will usually be drained with regular use in less than a day. And once the battery loses its charge, it will take several days for the solar panel(s) to recharge it – even under ideal conditions. The PortaMaxPower Solar Sentinel 2400 is a solar generator that was built to solve the problem of sustainability. The Solar Sentinel 2400 features a hybrid inverter/charger that provides 2,000 watts of continuous Pure Sine Wave AC power, with surge capability of over 6,000 watts. This makes the Solar Sentinel 2400 far more superior and economical when compared to high-end gas-powered Yamaha and Honda generators, allowing you to reliably power refrigerators, freezers, blenders, electric motors, and anything else you could plug into a standard electrical outlet. Another groundbreaking feature of the Solar Sentinel 2400 is the 24v 100ah LiFePO4 battery. The LiFePO4 has a high power to weight ratio, allowing it to hold a charge much longer than the lead acid batteries most other solar generators come with. In addition, the LiFePO4 is guaranteed to run at least 2,000 life cycles, which is roughly ten times the longevity of the cheaper batteries. The state-of-the-art LiFePO4 battery can be plugged in and charged electrically when you are on the grid. And when you are off the grid, you can charge it with the lightweight 330-watt solar panels. These panels are made with SunPower solar cells – the best technology in the industry – and they weigh only 8-15 lbs. each (depending on the type chosen). For most applications, we recommend using three 330-watt panels, for a total of 990 watts of solar power. This is more than three times the wattage (solar array capabilities) of most other solar generators. What all this adds up to is one word: Sustainability. Unlike gas generators that require lots of maintenance and need to be continually refueled, and unlike almost all other portable solar generators that will leave you without reliable power after a day or so off the grid, the Solar Sentinel 2400 provides an unlimited supply of renewable solar energy day-in and day-out, under real world conditions. When you are off the grid on sunny days, you can plug in a variety of basic electronics (any with a typical three-prong plug), and while you are still operating them, your battery will be fully recharged by around lunchtime. On cloudy days, your battery will still charge (thanks to our superior Sunpower solar technology), but it may take a full day. While charging on cloudy days, it is wise to plug in only your refrigerator/freezer and other essentials to allow the unit to fully recharge. Whatever the conditions, the PortaMaxPower Solar Sentinel 2400 delivers the ongoing power you need – even if you are off the grid for an extended period of time. previous post: Are you Prepared for a Long-Term Power Outage? next post: Winter Storm Quinn – Do you have Emergency Backup Power?